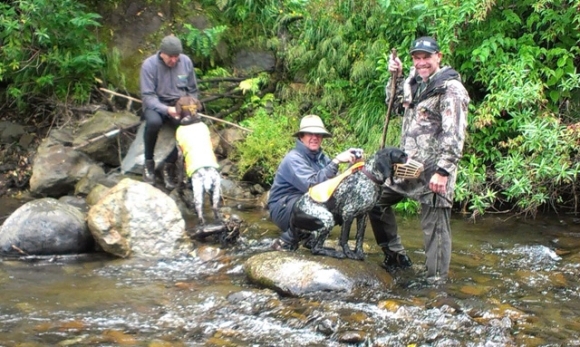 The Brand family from Wellington were the North Island winners of the Great Whio Adventure competition and arrived in Whakapapa Village in late January. 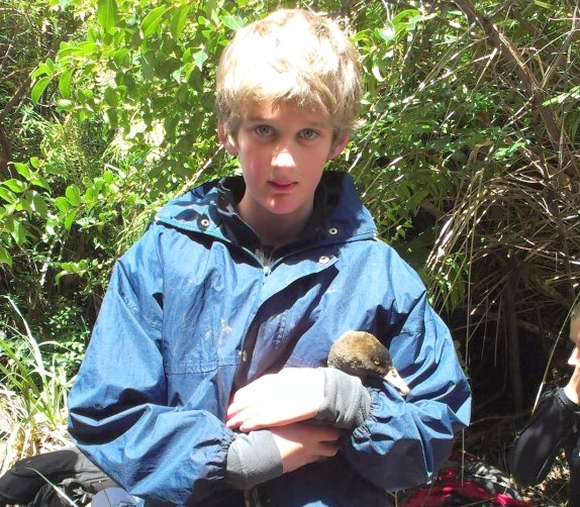 Jürgen, his wife Sarah, and their sons, Joshua, 18, Heinrich 14 and Daniel 12, had already spent a day white water rafting, but this didn’t stop them from returning to the local rivers with the DOC rangers in search of whio. DOC Rangers, Ali Beath, Dean Flavell, Andy Glaser and Malcolm Swanney, were joined by Bubs Smith from Ngāti Hikairo ki Tongariro (local hapu), conservation-dogs Neo and Fern, and myself. We all got kitted up with wetsuits and raincoats before the rangers gave us briefing and then it was off in a convoy of vehicles to a whio site in the Mangetepopo Stream, in the Tongariro Forest. After a steep and muddy descent the rangers showed us how they find and catch the whio for checking, tagging and releasing. With the help of Neo and Fern we located a group of whio upstream. The rangers unpacked and set up a fine net across the width of the stream. The whio were gently ushered downstream and into the net where the Brand family and I were hiding, ready to grab the strong-swimming ducks. “Try and make yourself blend in and look like a tree or a rock,” said Ali. I’m not sure that any of us looked like trees or rocks as we stood in water trying to stay quiet and still. A family of five whio were captured in the net and held above the water by each of the Brand family members until they were untangled from the net and placed in the holding bags. One of the juveniles staged a daring escape but was quickly tracked down and shepherded back upriver by Andy and Neo. Malcom, Fern, Jürgen, Andy and Neo. 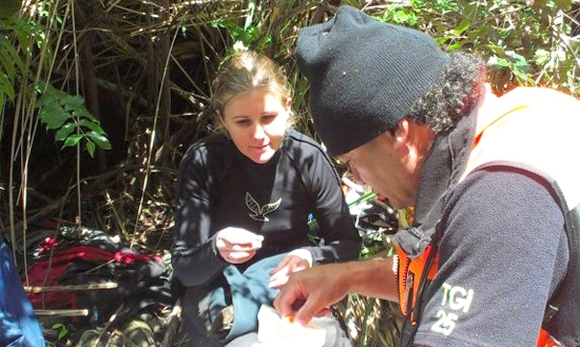 Fern was put through her paces that day to be certified as a whio dog… she passed. With all whio accounted for, the Brand family then helped microchip the ducks and place colour bands on their legs for identification. All whio get micro-chipped as a permanent identification method. The microchip is inserted into the back of the neck using a needle and will stay there for life. Adult ducks then have three colour bands put on their legs with each bird getting a different combination of colours. This allows the rangers to recognise each duck individually. This combined identification method also allows the rangers to read the microchips with a scanner and gather information on how old each duck is, who their mate is, the size of their territory and other details. This data is stored on a national database and is available through the Genesis Energy funded scanning tools. Following the checks and tagging it was time to return the mildly inconvenienced whio back into their stream. 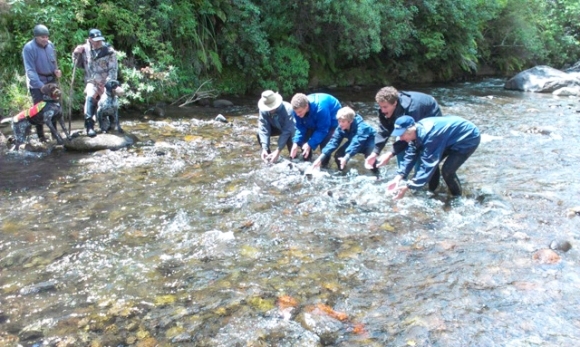 The Brand family took one whio each and together, released them into the rapids. We then left the stream just as the rain clouds closed in, and as we trudged (some of us trudging more than others) back up to the vehicles with the rain bucketing down. I was exhausted and could hardly put one foot in front of the other as I brought up the rear (thanks to Joshua for taking my backpack off me and Dean for carrying my rain jacket). I think I will either get fit at DOC or collapse trying! The Brand Family loved their adventure prize, especially the chance to walk in the wet boots of the DOC rangers for a day. Enjoy your own family whio adventure! Whio Forever are running the Great Whio Adventure competition again. If you know of a family that would enjoy this unique prize, encourage them to enter by 12 April on the Whio Forever website.